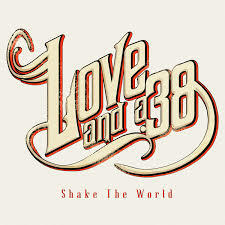 Since releasing their self-titled debut album in 2010, Los Angeles based band Love and a.38 have gained a steady following with their blend of huge riffs and gritty rock vocals. Melodic and dynamic with slight influences of alternative and southern sounds across their songs, it is fast paced full on rock. Band members Ryan Hudson (Vocals), Domo Domaracki (Guitar), Justin Emord (Bass) and Danny Excess (Drums) live and breathe rock. Massive guitars, thunderous drums, melodic bass and gravelly rock vocals, their music may have a few older style influences that can be picked up in their songs but overall there is something new and modern about this band. The self-titled album that featured the tracks ‘Shots At Sunset’, ‘Rock n Lola’, ‘In the End’, ‘Letter From The devil’ and ‘Shine Up Your Scars’ was 5 tracks of pure rock from start to finish. Epic guitar riffs and solos with huge anthemic sounding songs, this album gained over a million plays and sales of over 20,000 which for an independent band was a lot of interest. This was followed by singles ‘All Mine’, ‘Lovely Lies’, ‘Shake The World’ and the Corey Hart cover ‘Sunglasses At Night’ in 2012 before releasing a further single in 2013 ‘Just A Woman’. All of the songs are pure rock as its very best, dangerously addictive loud guitars with crashing drums, the vocals ranging from full on rock to melodic and great harmonies with a raw undertone running throughout each song, that all combine to make Love and a.38 an exciting band to hear. With performances supporting the likes of Slash, Black Veil Brides, Mötley Crüe and an appearance at the world-renowned South By South West (SXSW), their live sets are also full of raw energy, their rock sound more than holding their own against their more well- known contemporary bands. Love and a.38 are currently writing a new album which should be out in Winter 2014. Listening to what they have already released it is going to be one of those albums you need to have. Having heard them evolve into bigger and better things each time they have released songs, I have no doubts that the new music from the band is going to be the best they have ever sounded, and this from a band that already sounds awesome. The bands website is http://www.loveanda38music.com. They are on Facebook and Twitter @loveanda38 where you can get music updates and read about the world according to Love and a.38. Their songs can be heard on Spotify, SoundCloud and downloaded from iTunes and Bandcamp.